The robot, Justin, which NASA Astronaut Scott Tingle controlled from the International Space Station. 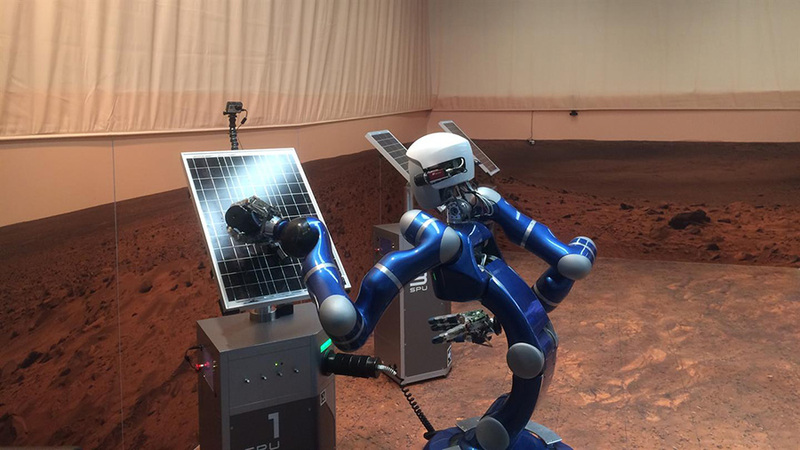 Engineers at the Institute of Robotics and Mechatronics in Germany set up the robot called Justin in a simulated Martian environment. Justin was given a simulated task to carry out, with as few instructions as necessary. The maintenance of solar panels was the chosen task, since they’re common on landers and rovers, and since Mars can get kind of dusty. Wow, time has gone by extremely fast. The mid-deployment phase will be short-lived for me this time, as the new crew (Drew Feustel, Ricky Arnold, and Oleg Artemyev) will arrive on March 23rd, and then we have at least one spacewalk on the 29th, followed by a planned SpaceX Dragon cargo craft arrival on the 4th of April. It’s a little strange being up here with only two other crewmates. We are still very busy, but the overall work effort is half of what it was just a week ago. My crewmate, Nemo (Norishige Kanai), and I are trying to use the time to prepare for the upcoming very busy schedule, and we have been having some great success getting a ton of details taken care of. Yesterday I had a funny event, though. I was controlling a robot named “Justin” who was located in Munich. The research and demonstration events were so interesting and fun that I offered them my lunch hour to do an additional protocol and have a longer debrief session. The ground team responded happily and accepted the offer – any extra time with crew onboard the International Space Station (ISS) is valuable to our programs. Halfway through the event, the team needed a few minutes to shut down and restart the robot, and I surmised that since I was skipping my break, this would be a good time to use the toilet. And I did, use the toilet. And literally 3 minutes later I returned, waited another 2 minutes for the robot systems to connect, and we began another great session controlling Justin from ISS with no loss to science. Later that same day, I was approached by the ground team in Houston (not the test team I was working with in Munich) and queried if something was wrong, and why did I have to take a toilet break while we were executing valuable science? They were concerned that I might have a medical issue, as taking a break in the middle of some very valuable science is not normal for us to do while on ISS. It’s nice to know that we have literally hundreds of highly-trained professionals looking out for us.